Stokes began in 1906, when “Dad” Stokes was making his famous chili and carting it up the hills west of Denver, Colorado to feed miners. Eventually, Stokes became a small cannery in Denver that manufactured chili with meat and beans, white beans with ham and tamales. 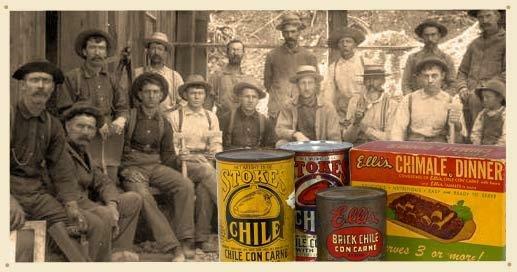 Denverites knew and trusted the Stokes name for great tasting, high quality chili. In 1975, Stokes set the wheels in motion and began producing Green Chile Sauces that quickly became a legendary favorite in Colorado households. The product was so popular that prior to the Internet, customers that once lived in Colorado but moved out of state began calling because they could not find Stokes Green Chile Sauce with Pork where they lived. Stokes began shipping individual cases to fans of the thick and creamy sauce across the nation. Stokes continues combining tradition with fresh premium ingredients to create exciting, convenient and flavorful mealtime solutions to our customers. Our products are minimally processed and do not contain preservatives. Stokes offers four varieties of Green Chile Sauce and a Green Chile Stew. The Stokes Chile Sauces are great for a heat and eat bowl of green chile or as an ingredient to a complete dinner meal. Stokes Green Chile Sauces are available on-line, and at various retail locations.